There is more than one way to type, and ergonomics is making sure no keyboard goes untouched. The Advantage2 QD USB Keyboard by Kinesis is here to change the way you work on the keys. Ease wrist strain and prevent carpal tunnel syndrome with the keyboard's unique, concave shape that keeps hands in a neutral typing position. Options to use both QWERTY or Dvorak modes make for efficient typing, with a legend printed on the keys for those not so familiar with Dvorak. 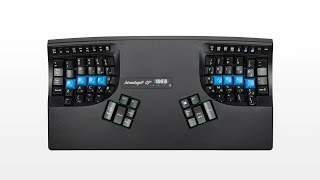 The Advantage2 QD Contoured Keyboard is also completely customizable. If you find yourself typing the same key combination time and time again, then you need macros on your side. Add up to 100 of your own macros to the SmartSet engine, and watch your work become more efficient. The Advantage2 Keyboard also comes with improved Cherry MX Brown key switches, which provide a very tactile typing experience. Turn the optional key clicking sound on when you need to let your cubicle mates know that you are working up a storm. Ergo typing is made easy on the Advantage 2 Keyboard. Use the Kinesis Low-Force Numeric Keypad for quick and easy data entry. Featuring the same low-force keys as the Kinesis Advantage2 Keyboard, as well as four hot keys and two USB ports, this is a handy addition to your workstation. For most users, this pedal provides more comfort than the triple action model. The pedal is front-hinged with a textured surface and a self-adhesive hook-and-loop tab is included to anchor the foot pedal to the floor. The triple action pedal is the best and most efficient way of taking advantage of your Kinesis Advantage2 QD Contoured Keyboard's foot input options. It can be configured to perform any user-defined macro or keystroke. As a rheumatoid arthritis sufferer, I bought this keyboard in desperation after several common ergonomic keyboards caused pain in my hands after about 2 hours. The Human Solution: The item was in stock, was shipped quickly, and arrived in great condition. The keyboard: It took a while to get used to the layout but it was well worth the time. I use this keyboard (along with the Evoluent vertical mouse) for 7 to 8 hours at a time without aggravating my arthritis. Not only has the pain in my hands decreased, but flare-ups have decreased as well. I'm overjoyed. As an added bonus, I can leave a "normal" keyboard attached to my machine for people who are not used to this keyboard. This keyboard is great! My first one lasted nearly 5 years, and I waited entirely too long to replace it, primarily because of the cost. But after using the Kinesis again for about a month, I'm glad I made the purchase. The real kicker is the placement of the Backspace key, which completely eliminates a wrist bend and reach for every typo. Everything on the keyboard feels ergonomically correct from the depth of the keys (the depth matches the diferent lengths of your fingers) to their positions - it all falls beautifully to hand in a totaly natural fashion, nothings a stretch. On the downside if your keyboard skills are not so hot then you'll have to be prepared to work at it. Typing exercises are povided and its not taking too long to adjust after working through them. The problem arises because with your fingers on the home keys your view of the majority of the keyboard is obscured, You've got too learn some low level touch typing. If you're like me and like stuff thats well made and just a little bit esoteric and dont mind paying a bit exttra for it then its a great buy. If your a fully fledged typist (i'm not) with repetitve strain injury it got to be worth some serious consideration as the ergonomics are spot on. I'm a CAD operator not a typist and was starting to suffer from tendonitis, the biggest single factor in reducing this to nothing has been purchasing a vertical mouse. The evoluent one i have at home is a no brainer compared with any standard mouse. ( I have a slighlty cheaper one at work.) The keyboard is playing it's part too. It was a very non-frustrating shopping experience. . . the keyboard WAS IN STOCK....and I received it very promptly. I need to know more about the Amia Chair. Arm rests? I hope not if it's intended for computer use. This product comes standard with a 3-year limited warranty. $339.00 List Price: $369.00* The list price is the same as the MSRP (Manufacturer's Suggested Retail Price). It may not necessarily be the price at which the product is sold.